The defending state champion Cavaliers (4-0) looked to be in trouble, trailing 39-28 with 6:51 to play, but they got a touchdown and a two-point conversion with 3:14 remaining, they forced Lake Oswego to punt with 52 seconds left, and then Jordan took them on a three-play, 59-yard scoring drive to take the lead. Clackamas defensive back Garrison Tooke returned an interception 58 yards for a touchdown as time expired, making the final score a bit misleading. "That was an amazing high school football game," Clackamas coach Joe Bushman said. "Hopefully, the fans got their money's worth. "We talked about how it could be a game like this, a back-and-forth game, and how you have to be able to bounce back after the other team makes plays. I was really proud of our kids. They had no quit in them." "Two good teams," Lake Oswego coach Steve Coury said. "Clackamas has a very, very good football team. I didn't like some of the calls that happened during the course of the game, to be really honest. … It just was horrible and I think people that were watching the game felt the same way. "It felt bad to me. It felt really bad, and that's unfair to the kids." There wasn't much Coury could say to his players after the game to help lessen the sting after the Lakers fell to 3-1. "I told them we didn't make enough plays and Clackamas did," he said. "That's a good football team. I told them that before the game, and our guys respect that team very much. But they made plays and we didn't. That's the bottom line." There were three plays that in the final two minutes of the game that stood out among all the big plays in the game. The first was when Lake Oswego was faced with third-and-1 at its own 36-yard line with 1:02 to play. Keenan DeRaeve, the 5-foot-10, 180-pound senior who had taken over as the lead back for injured starter Collin Bracken, got the ball on a plunge up the middle and was marked down just shy of the 37 -- a horrible spot from where Coury was standing. "The ball was 2 yards ahead of where they spotted it," Coury said. "It just was. I bet when we look at the film … I guess we'll see." Facing fourth and inches, the Lakers elected to punt, giving the ball back to Clackamas at its own 41 with 52 seconds left. After Lake Oswego drew a 15-yard penalty for face-masking that pushed the ball to the Lakers' 45, Jordan lofted a pass down the right sideline that Kennewell grabbed as he was getting pushed out of bounds at the 9 with 35 seconds left. That was big play No. 2. Only question: Did Kennewell have one foot inbounds when he made the catch? "I saw his foot go down," Bushman said. "You get good at watching kid's reactions, and as soon as he got that down, he was pointing, 'I got that foot down.' And I could have sworn that he got his left foot down." After a tipped pass nearly got intercepted with 29 seconds left, Jordan went back to the Clackamas huddle and called "jump man" -- a pass to Kennewell , running a fade route to in the right corner. It turned into the play of the game. Kennewell was well-covered by Lake Oswego's Matthew Sebolsky as he reached the back of the end zone and pulled in Jordan's pass. "All I could think about was, 'I have to get up and I have to get this ball,'" Kennewell said. "The game was on the line. I had to get it." But, once again, did Kennewell have a foot inbounds on the catch? "Honestly, I don't know," he said. "They called touchdown, so I say touchdown, and I'm cool with it." Sebolsky was ready to give the Lakers' side of the story when one of the Lakers assistant coaches whisked the senior defensive back away before he could answer any questions. There are no red flags for coaches to throw, no ability to check video replays at the high school level, although at least one sideline reporter captured the play on his smart phone. His video shows Kennewell was out of the back of the end zone when he caught the ball. The video also shows the side judge and the back judge signaling a touchdown the instant Kennewell secured the catch. "I think those guys were disappointed in some of the calls there at the end, but in a big game like this, there are big calls both ways," Bushman said. "I think we were both in agreement that it was a heckuva game. "I told Coach Coury if things go well for both of us, maybe we'll see them again at some point. This just felt like a playoff game to me. It had that kind of energy." 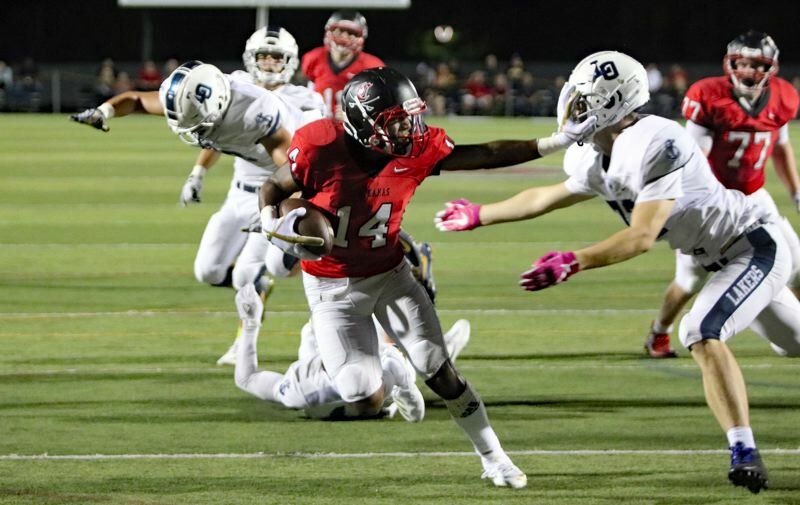 Lake Oswego had the early momentum, lost it, regained it when wide receiver Casey Filkins scored on a 3-yard run to break a 14-14 tie, then lost it again end Clackamas' Justice Pagan blocked the ensuing extra-point try to keep it at 20-14. Clackamas starting quarterback Austin Atkeson then led the Cavaliers on a six-play, 65-yard scoring drive that was aided by two Lake Oswego pass interference penalties in the red zone and ended with running back Noah Hobbs scoring on a 7-yard run to give the Cavs their first lead, 21-10, with 2:11 play in the half. The Lakers had a chance to regain the lead on a Diyar Dezay 24-yard field goal with nine seconds left in the half, but Clackamas' JeanElie Fleck blocked that kick to keep the score 21-20 heading into the break. After Clackamas' Jailen Hammer scored on a 4-yard run on the opening drive of the second half, Lake Oswego answered with three consecutive touchdowns -- a 64-yard, Laurent-to-Filkins pass play, a 9-yard run by DeRaeve, and a 3-yard run by DeRaeve -- to take a 39-28 lead with 6:51 to play in the fourth quarter. Atkeson, who rotated at quarterback with Jordan for Clackamas, then led the Cavaliers on a 13-play, 85-yard scoring drive that ended with Atkeson throwing a 4-yard touchdown pass to Nemo Dedmon with 3:14 to play. Clackamas wide receiver Thomas Tolonen tacked on the two-point conversion on a running play, cutting the Lakers' lead to 39-36. "Again, great game, they made some great plays, we made some plays, and it was a helluva game," Coury said. "Honestly, and we said this before the game, at the end of the game, it doesn't matter whether we win or lose, really. "Now, we're on the losing end, so we have to get our heads off the ground and come back, but there are a lot of lessons to take away from this game. I think tonight we proved we can hang with the big guys, whoever they are, and we can consider ourselves maybe one of them. We'll see in the end what happens." Lake Oswego finished with a 514-412 edge in total offense. Laurent completed 15 of 32 passes for 288 yards, with Durant making five catches for 101 yards, and Filkins finishing with four receptions for 101 yards. Bracken was the team's leading ground gainer with 11 carrries for 141 yards before leaving the gave with an ankle injury during the Lakers' final series of the third quarter. "I was proud of the defense," Bushman said. "We hung in there and we battled against Lake Oswego's run. Bracken took one 76 yards, and after that, I wouldn't say we bottled him up, but we contained him. "We didn't give up another big play in the running game for the rest of the game, which I thought was key. Wemade them have to do it through the air and they almost did. That's the sign of a good team when you can do both." For Clackamas, Atkeson and Jordan completed a combined 15 of 24 passes for 311 yards. Kennewell, who also caught a 48-yard touchdown pass from Jordan in the second quarter, finished with eight receptions for 233 yards and two scores. Hobbs had a team-high 12 carries for 62 of Clackamas' 101 yards rushing. "In the big picture, this helps us ranking-wise," Bushman said. "Right now, we're No. 7 or something, and when we get into our league, we play a few teams that right now don't have very good power rankings. So, from that standpoint, this game definitely helps us. "But even if we had lost the game, to me it was kind of a barometer of where we're at. If they're the best or one of the best, we're in the ballpark. So, this game kind of validated that we really do have some potential to be one of those teams at the end."